In this fun puzzle game you have one enemy – the robot. 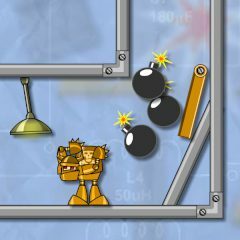 Place the bombs on the screen to set off a chain reaction so that the robot blows to pieces! Use your mouse to pick up bombs and place them in the areas where the explosion would cause complete destruction of your foe. Games Similar Crash the Robot: Explosive Edition!